Rational expectations has unquestionably become the standard way of modeling expectations in macroeconomics. Like the successful and widely–adopted first edition, this new edition is designed to explain the concept of rational expectations and its implications for macroeconomics. 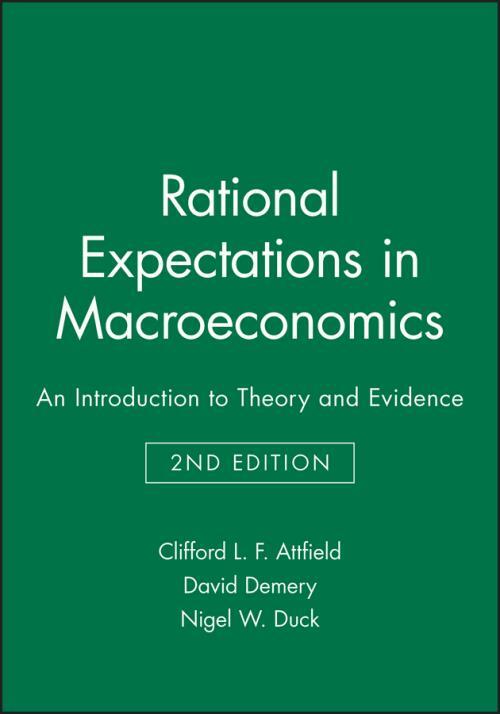 It fills the gap between introductory macroeconomics texts in which expectations formation is incidental and the technically advanced texts and journal literature on rational expectations. In this new edition, the authors have both extensively revised the presentation of much of the material covered and extended the coverage to include recent developments in the subject, most notably in the theory of aggregate consumption and the theory of real business cycles. 2. The Theory of Rational Expectations. 3. Testing the Rational Expectations Hypothesis. 4. Rational Expectations and a Flexible Price Macroeconomic Model. 5. Criticisms of the Flexible Price Rational Expectations Model. 6. Rational Expectations and Macroeconomics: Two Influential Empirical Studies. 7. Criticism and Reappraisal of the Lucas and Barro Models. 8. Real Business Cycle Theory. 9. Rational Expectations and the Real Income Hypothesis.